John R Beyer, author, has recently released his novel, Soft Target. He was gracious to provide the guest article below discussing how he got to know the character he created for the entertaining book. You will enjoy hearing about the process. Be sure to get a copy of his fast paced suspense thriller! You can find my review on Mystery Suspense Reviews. Writing about a former officer from the Russian Federal Security Services was not really what I had planned for my novel, Soft Target. The horrible murderous rampage which occurred on the 1st of September, 2004 in Beslan (in North Ossetia – North Caucasus region of Russia) which left nearly 400 dead, mainly children, and 800 injured was the incident that sparked the idea of a newbook. It occurred to me to ask myself a couple of questions. What if a group of Islamic Terrorists took over a school here in the United States? What sort of school would it be? A small private school? A public school? What grade levels would the terrorists be after? Who would be the villains and who would be the heroes? These were the sort of questions which entered my brain when I sat behind the keyboard in my office wondering if the story would be told and what would be the end results. Yuri Shakirov came into being, after I researched the Beslan massacre, as the protagonist for the story. A former special-ops officer from the RFSS (Russian Federal Security Services) who had been a firsthand witness to the death and destruction left behind by the terrorists on the opening day of the elementary school in Beslan. A worn out and sad man who had done his best for his country and all he received in return was the blame and the loss of his family at the hands of the terrorist survivors from the three day siege of the school. Working with Yuri as I did for over a year gave me a real understanding of why a person may choose to leave their home behind forever and make a new start somewhere else – in this case, that somewhere else was the United States. After writing about his experiences he began to go onthe lecture circuit as an anti-terrorist expert. Yes, as a writer I tend to believe my characters are alive while I write about them, speaking to them, about them, allowing them to drive the story – which drives my lovely spouse, Laureen, crazy. But, on a side note – after the novel was published by Black Opal Books Laureen found herself in an airport terminal and she called me on her cell. I guess she doesn’t think I’m as crazy now! The power of the written word – Laureen saw a man she swore was exactly like the man I had written about in Soft Target. Of course, Yuri is a fictional character but he was real enough to resemble someone in public. It wasn’t difficult to write about Yuri the Russian. My wife and I have travelled extensively and converse with many individuals, including military and police, in a number of countries. So there was much to draw on, personally. And then, I spent considerable time in reading Russian novels, researching Russian themes on the internet like police work, the inner workings of Special Forces and similar backgrounds to what I was writing. Yuri became clearer and clearer tome as each day passed. I pictured him as a frustrated man who had spent his life doing what he thought was for the good of his country only to be ridiculed and persecuted. He reminded me of Jonas Peters – the main character in my first novel, Hunted: an ex-cop from Southern California who had gone through similar issues as Yuri. He’d done his best but it wasn’t good enough. They both are haunted men in a world which generally goes against them. They survive since men like them always survive physically but are eternally emotionally scarred from the hatred and violence that surround them on a daily basis. Yuri survived the terrorist takeover of a public middle school in Southern California as he helpedthe local authorities with his expertise and even though there were very few casualties the concept of this would be the last terror attack on American soil never entered his mind. He knew it wouldn’t be the last but he also realized he would again be able to assist if called upon – that’s what he does. Yuri Shakirov is a hero but don’t ever tell him that – he wouldn’t allow himself to believe it. 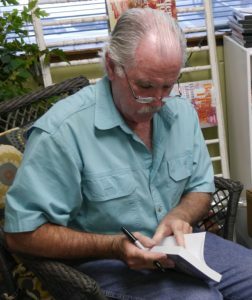 John Beyer has been writing most of his life. He’s traveled to at least 23 countries (and was actually shot in the head in Spain in 2000 during a march between Neo Nazis and Communists two days after running with the bulls in Pamplona). He was caught in a hurricane off the coast of east Baja (Bahia de los Angeles) while kayaking and lived to tell about it. Essentially, it’s hard to tell where experience leaves off and fiction takes over. You’ll want to read his books. How Many Movies can They Remake? Edamame In Ponzu Sauce Wins!